KVM Switch for Server acts as a switch that connects a set of devices with multiple workstation computers with a physical mouse , keyboard and a screen. Previously we published a basic article on switch. What number of servers a KVM switch will able to connect that depends on the model of the KVM switch itself. Depending on the model of KVM Switch, an user can control from one workstation between two and 64 computers, some KVM switches can also follow a mechanism to reach a larger number of computers that can be controlled. Monitor, keyboard and mouse are connected directly to the KVM switch. To connect the KVM switch with server computers there are ports in addition to the standard cables with VGA, DVI, USB and some proprietary cable connectors on the KVM switch. This offers the advantage of faster connection and makes it mechanically stable. There are KVM switches with modular terminal design, which connects to each computer using an adapter. Switching is done via a push button, a rotary switch or a hotkey like a shortcut key, for example by double pressing a certain key on the keyboard. Most KVM switch used today, except the older, purely mechanical switches, provide the facility of emulation of the keyboard and mouse that the computer is connected to both devices continuously and that settings is saved for each computer separately. It avoids the interference in the operating system and drivers with the respective hardware. Almost all KVM boxes has LED or numeric displays, for easy understanding of work flow. 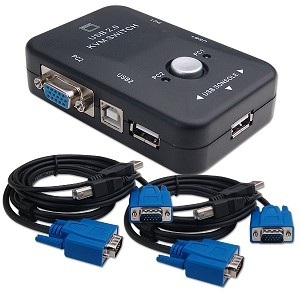 For workplaces, there are special KVM switch available for dual or quad video output support, in some models of KVM Switch, this can emulated by multiple KVM Switch coupled together for this purpose. Larger KVM switches for system intense applications or crucial usage such as for the data centers have connections for two or more and allow the simultaneous work of several administrators to work with different computers. Such KVM Switch devices are called multi-user KVM switch or Matrix KVM switch. Simultaneous access to the same computer by multiple administrators is often needed for several purpose. Devices of this category usually have a sophisticated security system with password protection and restriction of individual users to specific computers. The selection of the computer can be done via on screen display menus that display the previously configured name of the computer. This Article Has Been Shared 7892 Times! Cite this article as: Abhishek Ghosh, "KVM Switch for Server : Keyboard Video Mouse Switch," in The Customize Windows, August 26, 2012, April 18, 2019, https://thecustomizewindows.com/2012/08/kvm-switch-for-server-keyboard-video-mouse-switch/.